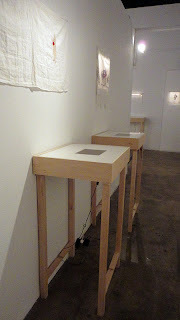 This exhibition ended on December 10, and I had seen it a month earlier. But oddly enough, it is stuck in my mind. Odd, because this is not the type of work that usually appeals to this 50-something gay guy - and some video, no less, that I usually never even notice. Hadar Sobol was born in Israel and earned her Bachelor degree at The Israeli University for Fashion and Textile Design. She was quite pregnant during the creation of some of these works, and still very much so on the day I stopped by The MAC to see the galleries. The director of the gallery asked me to wait a bit before viewing the show while Sobol made some minor adjustments. 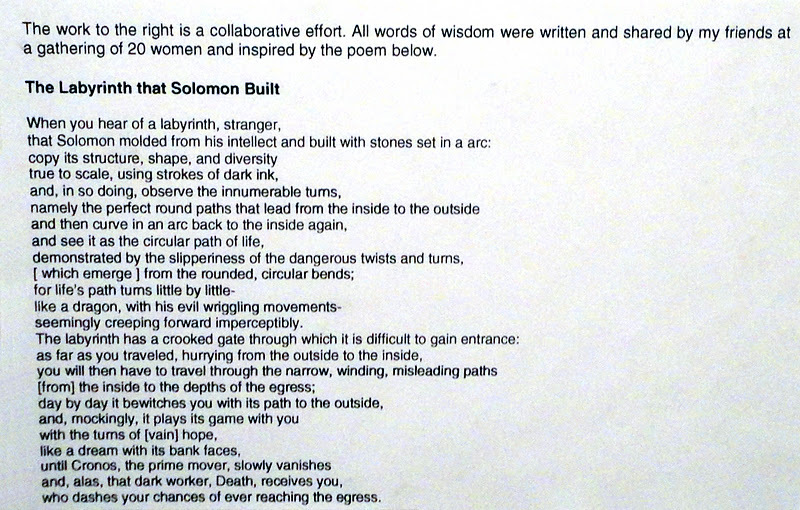 I have no idea how this one sculpture that was sixteen years older than Drake's newest drawing related to the drawings, but it did resonate, at least to me, with Sobol's work that I moved toward next. As I stated earlier, it is unusual that I am still considering this work. 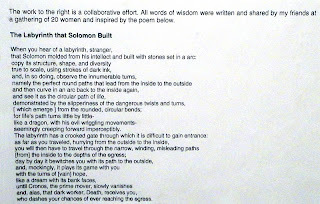 But since it is the first day of winter, and the third night of Hanukkah, and two days before I will be celebrating another pregnant Israeli woman's gift to the world, I am documenting Sobol's works and my thoughts about it. The first thing I noticed was a rather permanent looking, though temporary wall, that created a long narrow entry way. Two light tables with short loop videos were playing beneath a thin veil of embroidered cloth. More embroidery hung along the walls, and several of these were hung on top of small lines of LED lights that caused the cloth to radiate a warm glow. The wall helped me to feel a new sense of being in the small New Works Space in which I had seen a show earlier in the year that felt more like a day spa lobby. Sobol's exhibition was decidedly different, more intimate, more of a story. We have a labyrinth at church. I understand a labyrinth to be a sacred space, a tool to pray and meditate, and as a metaphor for a life's journey or a journey into one's deepest self. For some reason labyrinths feel feminine to me. Perhaps it is the curves, or the non-linear approach to a journey, or maybe it is my association with the first four letters of the word. But in this case we are told that this work was created by a gathering of 20 women. 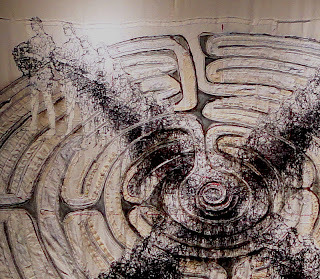 We see stitched figures moving around the labyrinth in an overall "X" pattern. 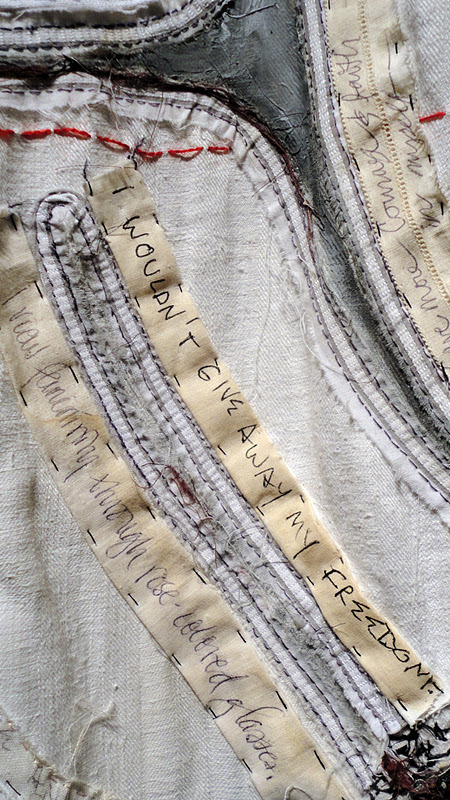 Upon closer inspection we find interesting text stitched into the fabric. My gay self keeps screaming that I should be repulsed by this. Strangely I'm not. Is it the iridescent threads that glitter? I do love shiny sparkly things. Sobol has displayed this work beautifully. The cloth rests in a valley created by the way the table is constructed. We see this as a vessel for receiving that which will eventually cause the same vessel to bring forth new life. What is the sparkle? Post coital secretions - his, hers? Perspiration as the labor begins to expel the living contents? 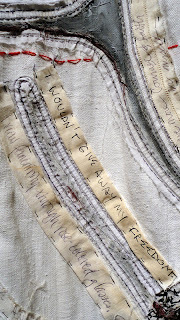 Layers of meaning and context via simple shiny threads. Indeed! Mine's not a great video - shouldn't be, it's just my documentation. Sobol has the original and it should be seen. But mine provides a visual reference. We see a very pregnant women seemingly quite capable of providing amble nourishment for her imminent offspring. 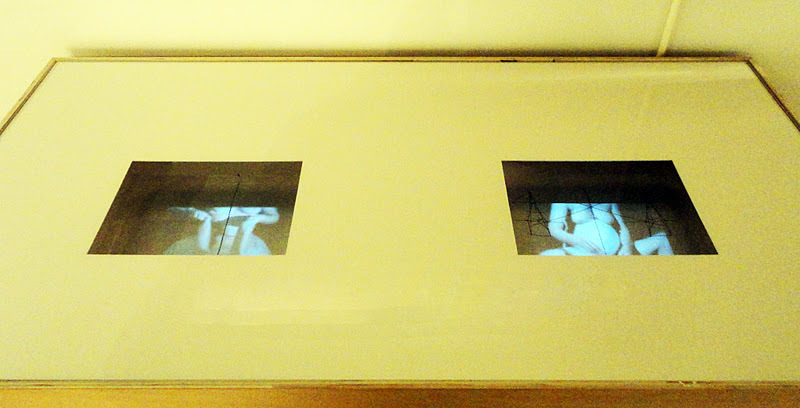 We view the video under an embroidered linen. The video is a very short loop and the action is simple. She seems to be gathering thread and then stitching it into place on a line in the linen in front of the video. 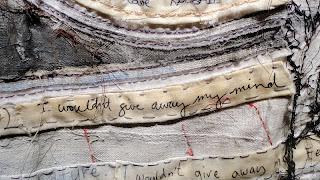 The action is repetitive just as sewing and embroidery are. Just as the actions of our daily lives are that eventually accumulate into the journey of our lives. 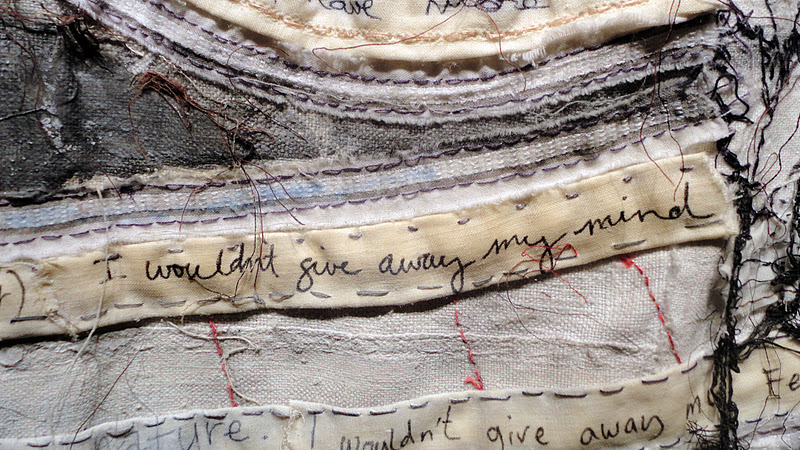 Sobol said this in her artist's statement: "My other source of inspiration involves both the visual and spiritual idea of the Torah Wimples (a cloth used to bind the Torah during a bar/bat mitzvah and a cloth used to swaddle a baby boy during his circumcision). I was fascinated by the symbolic way it provides an opportunity for a mother to connect her baby with the family, the community, and the Jewish nation. My intent was to embrace part of this tradition and create for my daughters a personal and unique version of the wimple as a way to pass on a woman's legacy; insight and wisdom gathered by life experience through generations." I've only attended one bat mitzvah in my life. My third grade Catechism class loaded up on a Saturday morning for a "multicultural experience", probably while they thought we were too young to jump ship. But I still remember the experience. Temple Emmanuel is a gorgeous synagogue in Central Dallas. I still think about that time as I drive by. Temple Emmanuel is next to the cemetery where my first partner, Dennis, is buried. I have a wonderful view from his grave through the trees of Neiman Marcus at NorthPark Mall.